The White House today released an official statement rejecting a "We the People" online pardon petition for Edward Snowden. The petition had 167,000 signatures. Dan Froomkin at the Intercept has more. He’s barred under the Espionage Act even from arguing that his leaks were justified; he wouldn’t be permitted to utter a word about that. An editorial in the New York Times requests clemency for NSA surveillance whistleblower Edward Snowden. In retrospect, Mr. Snowden was clearly justified in believing that the only way to blow the whistle on this kind of intelligence-gathering was to expose it to the public and let the resulting furor do the work his superiors would not. ...When someone reveals that government officials have routinely and deliberately broken the law, that person should not face life in prison at the hands of the same government. 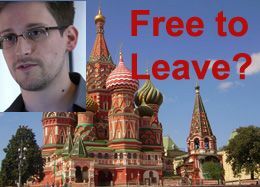 ...President Obama should tell his aides to begin finding a way to end Mr. Snowden’s vilification and give him an incentive to return home. Russia has given asylum to Edward Snowden for a year. He has left the Moscow airport. He is with a member of the Wikileaks legal team. Why only a year? Maybe Russia is hoping that in a year's time, the U.S. will reconsider its refusal to hand over Victor Bout and Konstantin Yaroshenko in exchange for Snowden. President Obama addressed Edward Snowden at a news conference in Senegal today. Shorter version: He's a 29 year old garden variety hacker. He rejected the suggestion that he might order the military to intercept any plane that might be carrying Mr. Snowden. “I’m not going to be scrambling jets to get a 29-year-old hacker,” Mr. Obama said. It was thought Snowden might fly to Cuba today. Reports from Ecuador as to whether he will be welcome there are conflicting, but Ecuador today renounced its trade pact with the U.S. saying it would not be blackmailed. "We now understand Mr. Snowden is on Russian soil. Given our intensified cooperation after the Boston marathon bombings and our history of working with Russia on law enforcement matters -- including returning numerous high level criminals back to Russia at the request of the Russian government -- we expect the Russian Government to look at all options available to expel Mr. Snowden back to the U.S. to face justice for the crimes with which he is charged." Snowden Flies to Russia, and Then? Update: Ecuador announces it has received an asylum request for Snowden. 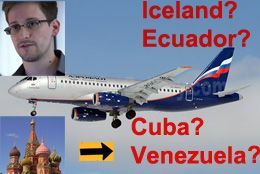 Update: There are reports that Snowden, whose plane arrived in Moscow, will spend the night at the Venezuelan embassy in Moscow or at the Sheremetyevo airport and then fly to Cuba, and then to Caracas. (Source article here.) Wikileaks says it is assisting with his travel arrangements. The U.S. got a bit of a kick in the pants Sunday as Hong Kong said the paperwork it submitted for Edward Snowden's detention pending extradition did not comply with Hong Kong law. To rub it in, Hong Kong said it asked for more information but didn't receive it. So, Hong Kong said, it had no legal reason to insist Snowden stay in Hong Kong or arrest him. The Washington Post reports Edward Snowden has been charged in a sealed complaint in the Eastern District of Virginia with espionage, theft and conversion of government property. The U.S. is expected to seek a provisional arrest warrant for Snowden and his extradition from Hong Kong. Snowden can fight the extradition. The treaty does not allow extradition for political offenses.